The long awaited and anticipated 300x Explorer Solo Adventure Series Kayak is finally here! Now you can do what others only dream of with our most versatile kayak ever! And this one is made for one, the 300x stands alone in a class of it's own! Designed to tackle whitewater as well as open-water this kayak is sure to add years of fun! Comes with inflatable DKS seat and AB 30 paddle. Capacity: 1 Adult or 179 kgs. 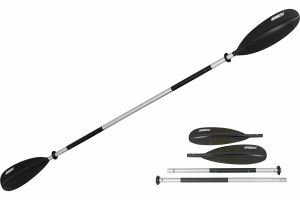 7'10" Double end asymetrical paddle is great for all our canoe, kayak and paddleski models. The paddle features aluminum shafts with Fibrylon blades. It has a 65 degree feather capability. Snap lock buttons to disconnect into 4 parts. Weighs just 2.62 lbs. Deluxe Inflatable Seat. 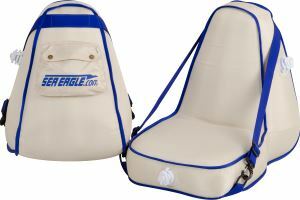 A great inflatable seat that provides extra back support for paddling, rowing or fishing. 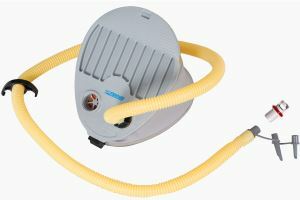 A high capacity foot pump made of durable ABS plastic that packs down for easy travel. Comes with triple styled nozzle for use on deluxe one-way valves.